Now that I know exactly what I’m looking for, it’s time to buckle down and try to find some real-world LED displays for the time circuits. For my project specifically, I would also like the displays to be common-cathode because of the HT16K33 driver. (Although I can always swap out the driver if I find the displays in only common-anode.) I’ll also need to make sure the displays have a black face, and that the 7-segment displays I choose have a “hard” edged font for the digits. This is a pretty solid list of specifications, although they are rather specialized. Now I need to match them to actual parts. Let’s start by covering where I can get LEDs. There are two options: either buy from an electronics distributor, or buy directly from the manufacturer. Because I’m buying such low quantities (i.e. < 1 – 10 of any given part), it’s more likely that I’ll have to pay premium prices from a distributor. Although when searching it’s often useful to look at manufacturers directly because they have a complete list of their part offerings. There’s a third option, which is to contact a manufacturer and have custom LED displays made for this project. I’m a hobbyist making this prop for myself – I don’t have the luxury of spending $1000+ on perfect LED displays. But if the rest of the design is solid, I could always replace the display circuit boards in the future. While there are a lot of 7-segment displays on the market, none exactly match the ideal specifications. It seems that 0.60″ is not a common digit height – meaning that there are a few displays made, but they aren’t available with the options I need. The closest common digit heights are 0.56″ and 0.80″. 0.56″ is only slightly off of 0.60″, and it is a very common size. 0.50″ displays are also made, although they aren’t common. 0.8″ displays won’t work because of the display size. For the 0.50″, 0.56″, and 0.60″ digit height displays, the ideal display width of 0.5″ still seems to be the standard. This is a crucial number, as it dictates the look of the combined digits. The display height is not as critical, so long as it’s taller than the faceplate opening and short enough to fit in the enclosure. A height of 0.75″ would work fine – a height of 0.673″ might not. I found displays of both sizes. A digit height of 0.80″ is significantly bigger than 0.60″, and the display’s casing size increases to compensate. Many of the 0.80″ displays I found have a display width of 20 mm, meaning that 13 displays side by side without any spaces would be be ~1.75″ bigger than the LMB Heeger enclosure. I could ditch the enclosure and scale everything up, but I think that’s going to just lead to more problems than anything else. A large number of displays that are otherwise close to what I need have “soft” edges to their digits, which throws off the ’80s look. The “hard” edged displays seem harder to find, although they are still produced. This is the killer for most display options. I want all of the displays to match, which means I need a 7-segment display that is available in red, green, and yellow with the exact same size and pin layout. For instance, Stanley Electric Co. has 0.6″ 7-segment displays in both red and green, but not yellow. They would work for one standalone display, but not all three in one unit. To make matters worse, I can only buy displays that are readily available. I don’t have the funds to place an order for 500+ displays to be made on demand. If the 7-segment displays are difficult to find, the alphanumeric displays are impossible. Unlike 7-segment displays which are still used for clock readouts in many appliances, alphanumeric displays are being phased out in favor of cheaper and more detailed LCDs. Only a handful of companies produce 14 or 16-segment alphanumeric displays, and the number of companies that produce them in three different colors is smaller yet. The same limitations for digit size, display size, color, and availability all apply, although the difficulty is multiplied by the fact that there are so few options to begin with. Like the 7-segment displays a 0.60″ character size is not common, although for the alphanumeric displays neither is 0.56″. The most common sizes appear to be 0.39″, 0.50″, and 0.54″, although the 0.54″ displays are primarily dual-character. While the killer for the 7-segment displays was the color options, the decimator for the alphanumeric displays was the number of digits available in a single unit. Think about it from a manufacturer’s perspective: one digit doesn’t tell the user much. Two digits tells them a lot more. Anything more than that and you may as well use an LCD. I found a variety of single-character displays, and an even greater number of dual-character displays. I could not find a single company that produces a 3-character 14 or 16-segment LED display on a commercial scale – regardless of digit size, color, or common type. Bummer. Because of this, I decided to do my best with the single-character displays I could find. The issue with the number of digits also throws such a huge wrench into the display size problem that it almost isn’t worth talking about. The display packaging for single digits with this many segments is always going to be larger than it would be if the digits were together, full stop. 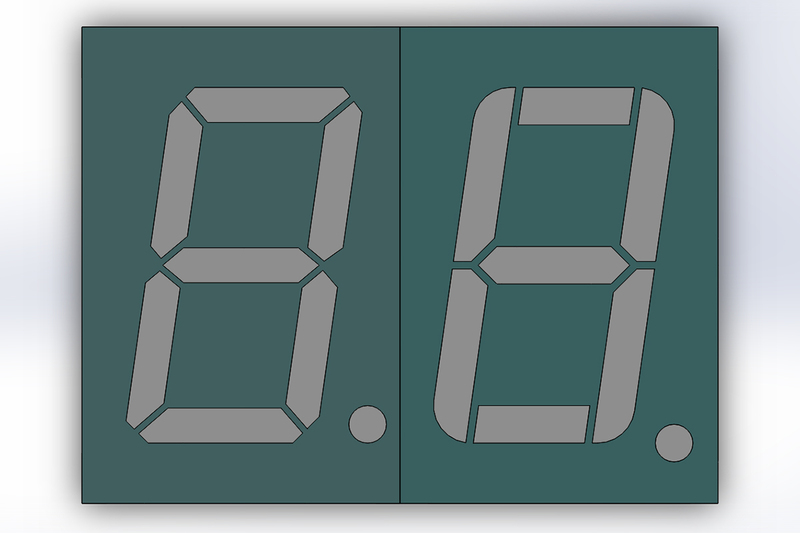 The dual digit displays are closer together, but I cannot fit four displays side-by-side in the enclosure and still have the ‘day’ displays properly spaced. My plan is to get the narrowest single-character displays I can and resize the rest of the spacing to fit. All of the displays are made by Kingbright and have the same wavelengths so they should match in color. Although you can see that the brightness doesn’t match between the alpha and seven segment display types, this isn’t a big deal – the “month” displays in the film don’t match the rest either. I can also add a resistor array or ND gel to even things out if need be. The two seven segment options. The displays on the left have the “hard” edges I want, but have an eight week lead-time. The displays on the right have “soft” edges, but are readily stocked. It turns out that Kingbright makes these same displays with “soft” digit edges, and these are available right now. According to the datasheets these displays are identical in every way to the chosen displays – pinout, dimensions, LED characteristics, the works. I have a few ideas for mini-projects using time circuit displays, so my plan is to build my first set of circuit boards using these “stand-in” displays, and then swap them out for an updated second set once the hard-edged displays arrive in ~ 8 weeks. This is assuming, of course, that the PCBs are designed and manufactured before then, which is a big “if”. Since the displays I’ve chosen don’t match the ideal, I thought it would be useful to make a table of the differences between the sets. Yeah, it’s not too pretty. But that’s what we’ve got. Obviously the digit spacing is the standout number… I’ll need to re-arrange the case’s faceplate to make everything fit together. The seven segment displays are a lot better. If it weren’t for the digit height and the face color, they’d be perfect. 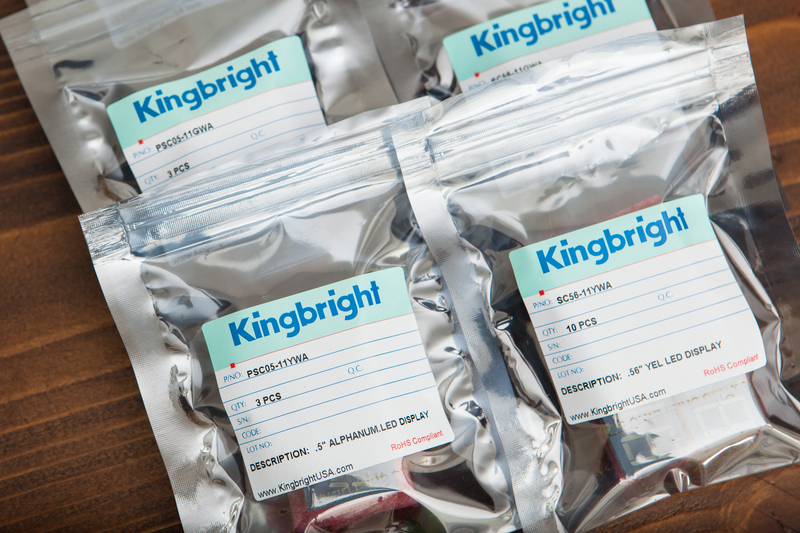 Another benefit of selecting Kingbright displays is that I can buy directly from Kingbright in low quantities. The displays are relatively inexpensive (~$1.25 each for the alphanumeric, ~$0.70 each for the 7-segment), and shipping is reasonable. I was able to get all three sets of LED displays I need for my build for around $30. Since I cannot order the Holtek chips from a major U.S. distributor (Mouser, DigiKey), there’s little point is trying to keep everything organized to buy from one supplier. Note: The 7-segment displays with an 8 week lead-time are available from distributors for an increased price, although I couldn’t find a distributor that had the yellow displays in stock. Since I’m waiting for those anyways, better to save the money and order them all directly. That’s it! After much searching, I finally have my LED displays. While it’s disappointing that I couldn’t find better alphanumeric displays, I’m still hopeful that the assembled circuit boards will look convincing. Next Up: Designing the display casing. The LED displays from Kingbright have arrived! Although their website quoted an 8 week lead-time, they arrived in just 19 days! I’m glad I purchased the “stand-in” displays if only for peace of mind, but they won’t be needed for the rest of the project. According to Tim Good in the comments, it looks like Kingbright has discontinued production of both the PSC05-11YWA and the SC56-21YWA displays due to low usage. The replacement alphanumeric display is the PSC05-12YWA, although it evidently has different pin assignments and would require a separate PCB. The replacement 7-segment display would be the SC56-11YWA (the “stand-in” display above) with soft character edges. For the next build, it might be time to take another look at display availability and make some substitutions. 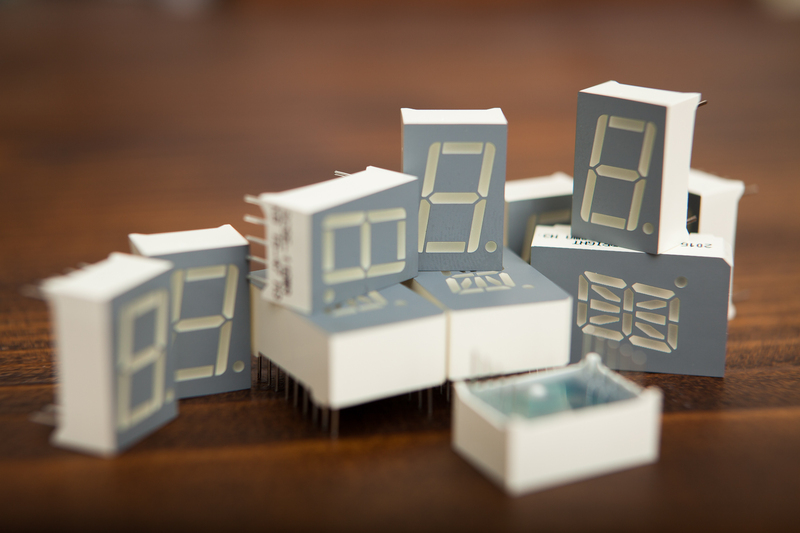 Have you considered 3D printing your own alphanumeric displays? In that way you could put the SMD LEDs in the required positions to accurately reproduce the films masked displays. Furthermore, you could sell them!. I disassembled a 7-segment display and it shouldn’t be difficult to re-engineer one using a custom 3d-printed matrix, fill it with clear resin and creating a custom PCB. The addressing of such display can be easily done. I wish you the best with your awesome project. I did consider taking a crack at building my own custom displays, but I figured that I didn’t have the tooling to build displays of the quality I thought the project deserved. I also thought about contacting some Chinese companies that specialize in segmented displays for a custom order, although as a hobbyist I didn’t want to spend a lot of money for 500+ displays when I only need a few of each color. If I do ever rework the display boards, I think you’re right and it would be wise to look harder at building my own displays. Though for now the Kingbright displays will have to suffice. Nice rework of the website, looks great! Just to let you and everyone know, Kingbright has discontinued the PSC05-11YWA and the SC56-21YWA due to low usage. They replacement is a PSC05-12YWA but this has a different pin assignment so the layout of the PCB would have to be redesigned. The SC56-21YWA can be replaced with the SC56-11YWA which as stated has a slightly different appearance. A few SC56-21YWA are available at Mouser, but I have been unable to find the PSC05-11YWA anywhere. Still hoping to see the finished product, Dave! Thanks for the update Tim, that’s unfortunate. I’ll add that information to the bottom of the post. Project is still on the backburner for the time being :(. Way too many other things demanding my attention.